Second year U.S. Open sponsor, Moët & Chandon, has stepped up its activation with the opening of the tournament's first-ever champagne bar. 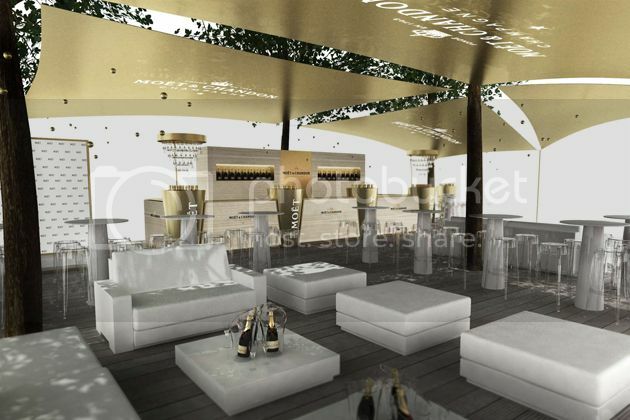 Designed in the brand’s signature style, the Moët & Chandon Terrace at this year's tournament will feature an outdoor lounge environment serving Imperial Champagne along with a full complement of bar options. "The partnership with the US Open marks a strong commitment to the world of tennis. There is no better place to showcase Moet & Chandon's values of success, glamour and celebration of victory than at the world renowned US Open," stated Ludovic du Plessis, Vice President Moet & Chandon US. "Moet & Chandon looks forward to celebrating with both the champions and the fans of the US Open." "The US Open is where athleticism, entertainment and international star power converge, and we are thrilled to have Moet & Chandon be part of it," said Lew Sherr, Chief Revenue Officer at the USTA. "We are equally excited that Moet & Chandon's 'Cheers for Champions' charitable campaign will once again continue their connection with tennis beyond the US Open and help us transform lives through tennis in a meaningful and lasting way." In addition to its U.S. Open deal, Moet, a longtime sponsor of tennis, recently extended its global involvement in the sport with its appointment as the official champagne and global partner of the ATP World Tour.